Choose an animal to adopt below! Looking for thoughtful, unique, and meaningful gifts for all the animal lovers in your life? Wildlife Rescue’s Fur & Feathers wildlife adoption program is a great way to help countless injured animals get a second chance! This holiday season, take advantage of adopting the symbolic species below for all the special people in your life who care about wildlife and our precious environment. You may want to finish your shopping list right here!! Anna’s Hummingbirds may be common along the Pacific Coast, but they are always a treat to see. They have iridescent emerald feathers and rose-pink throats, often referred to as “flying jewelry”. The Downy Woodpecker is one of the smaller woodpeckers, even joining in flocks of chickadees and nuthatches. Common Loons are a lovely sight on the lake, with their piercing red eyes and black and white feathers. The Great Blue Heron is one of the loveliest birds to catch sight of in the wild, with their distinct stance, motionless and intense. The Cooper’s Hawk is ranked among the world’s most talented flyers, soaring agilely through cluttered tree canopies. The Northern Pygmy-Owl may be small in size, but it makes up for this with its talented hunting. Douglas Squirrels are relatively small, measuring about 30 cm, of which nearly half is their tail. 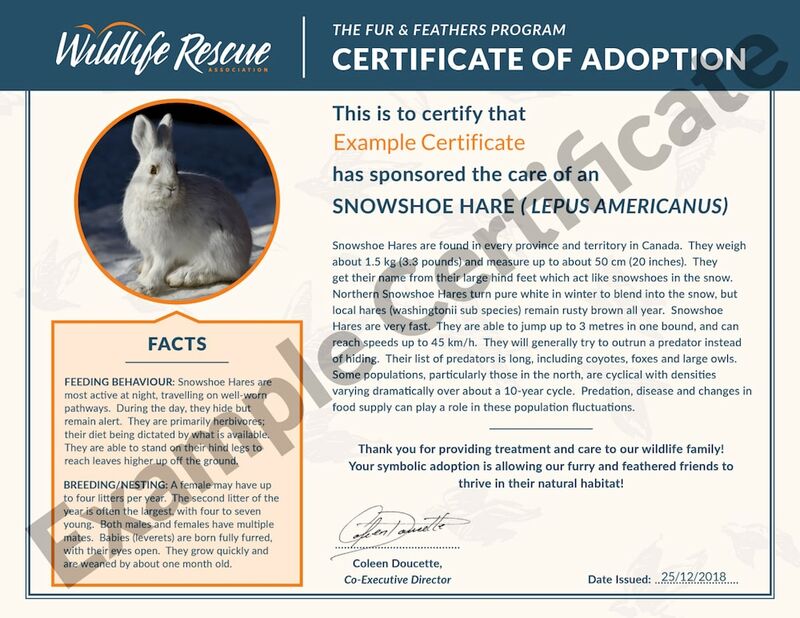 Snowshoe Hares are found in every province and territory in Canada. If you have selected animals, this amount will be added to your adoption total upon checkout.